Clearly influenced by his Moroccan origins to deconstruct the repercussions of colonialism in his homeland and wider region, Mohssin Harraki (b. 1981) traces links between past and present, throughout his multidisciplinary practice consisting of drawings, video, installation and photography. 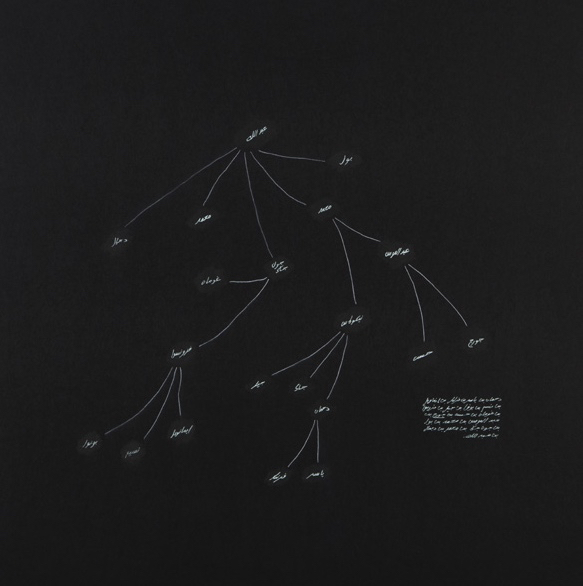 In his series of drawings under the title Inconnus (2013), presented at this year's edition of Art Dubai with Galerie Imane Fares, Harraki's arabic writings adopt the shape of family trees, either vertical or horizontal, to highlight both continuity and the absence thereof, when it comes to our culture, history, and traditions. The intricacy existing between relationships is signified by often convoluted shapes and scribblings, with side notes assisting in the mental excavations of the past and possibly enlightening about the transmissions of knowledge and power.